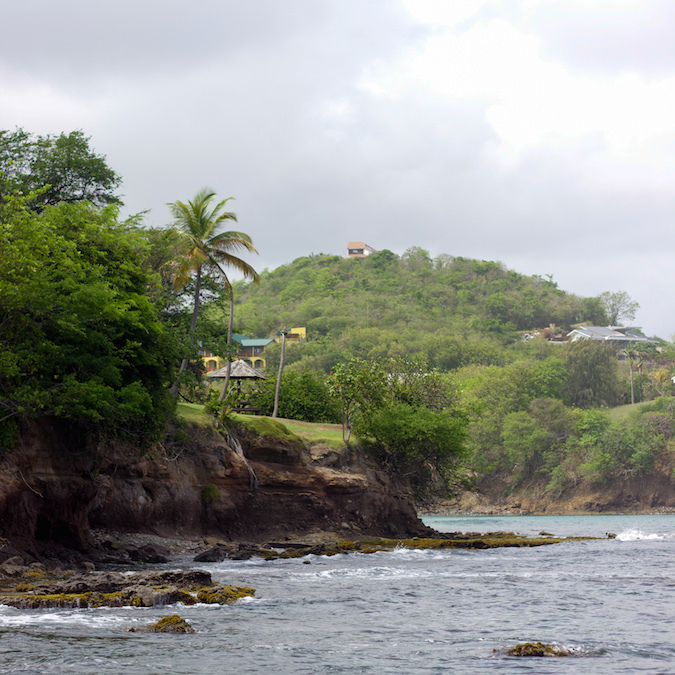 There is a wooden staircase behind St. Lucia's Cap Maison resort that leads down to a rocky seaside escape. Waves crash at your feet as you stand on the small stretch of sand just below the cliff. Look up and you'll find a private deck made for a romantic dinner over the sea. Travel down and you'll find a semi-natural dipping pool carved out of the rock you stand on. Quiet escapes like this make St. Lucia more than your expected Caribbean vacation. There is adventure everywhere, as long as you are willing to leave your poolside lounge chair to find it. It was only fitting that I channeled some safari vibes with this olive romper for this moment of exploration. Look back in my archive and you'll see that I have a weakness for rompers. Like dresses they make for seamless outfit decisions in the morning, but with a touch of added playfulness. The lightness of this Tobi piece is just what my wardrobe needs for the transition into summer (or another trip, perhaps?). You should! It is one of my new favorites! You must visit sometime! It is beautiful! Woah, you're so pretty, so is your outfit. St. Lucia's sea side part looks so relaxing, I need to go there. Aw, thank you! Hope you get to visit sometime! I love your romper so much and this place is so beautiful! You look gorgeous! Do you want to follow each other on Bloglovin' or GFC? Let me know! Amazing outfit and amazing view!! Gorgeous photos! Love this romper on you. I love the caribbean St. Lucia sounds like a beautiful destination. Cute romper by the way you look gorgeous. You are truly a mermaid ;) HAPPY MAY DAY!! This romper is gorgeous on you! Such a beautiful shoot! Although seeing you on the edge of rocks makes me a bit nervous haha. Gorgeous scenery and love Tobi's rompers! Wow, you look fantastic! And the landscape is awesome! This is breathtaking Christina and as always you are dressed the part! OMG!you look so fantastic! And the landscape is awesome! beauty girl and beautiful scenery looks comfortable. On our visit to this place, we mostly stayed downstairs, where the beer and liquor selection was quite admirable. The staff at venue NYC really pride themselves on the beers and food they have.